EPHRAIM, UTAH — No longer rookie bloggers Chloe and Sarah here, coming at you from the sweet comfort of our couch in Utah. 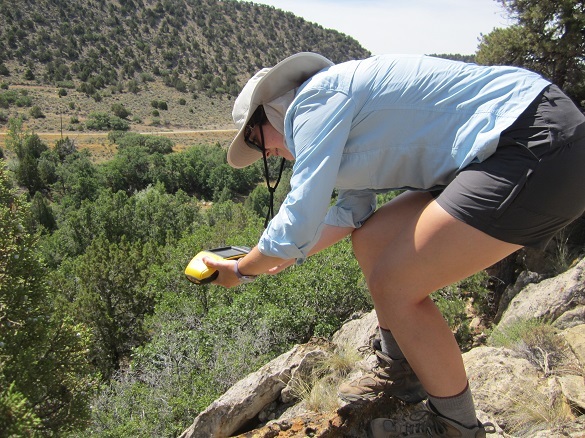 Before collecting pounds of oncolites and encountering countless kill sites, we were just two inexperienced field geologists spending our long days becoming pros with the Trimble. The Trimble is a survey grade GPS unit. 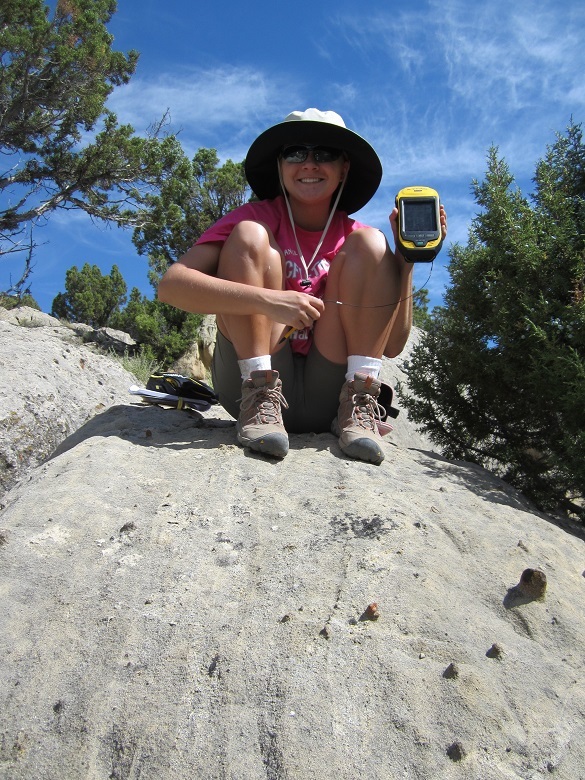 We used it to map the many iron concretions throughout the Six-Mile Canyon Formation. Over the course of a day and a half we were able to map over 200 points on one single rib of the outcrop. As you will see below it takes a truly skilled and brave geologist to be worthy of the power that is the Trimble. Lesson learned: do not forget to zip the pocket that is holding your camera as you lean over a steep cliff just to collect a single data point. Thankfully, Sarah’s camera survived the fall and still works somehow. Nikons, people! Also as Sarah was retrieving her camera she came upon some lovely iron staining that otherwise would not have been discovered. There’s always an upside! How to Trimble 101: This isn’t your basic car GPS. Seconds before Sarah dropped her camera down the side of the cliff. All in the name of science! The iron staining Sarah came upon while retrieving her camera at the bottom of the cliff. We’ve gotten too used to this view. We’re going to miss Utah! Thanks for an amazing two weeks full of scalding heat, accessibility to more Peace Tea than one human should consume, and unforgettable geology. 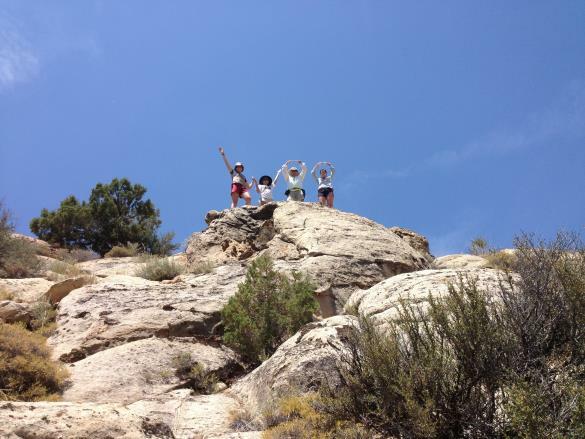 EPHRAIM, UTAH — Rookie bloggers, Sarah and Chloe, coming at you from beautiful Ephraim, Utah! We’ll admit early on that are blogging skills are not the most proficient, but we’re giving it a shot (mostly because we are being “strongly encouraged”). We figure plenty of enticing pictures will make up for what we are lacking. We began a new project in the field on Thursday. We gathered data and collected oncolites in the North Horn Formation. We measured over 50 oncolites within the rock face and collected about a dozen float samples. 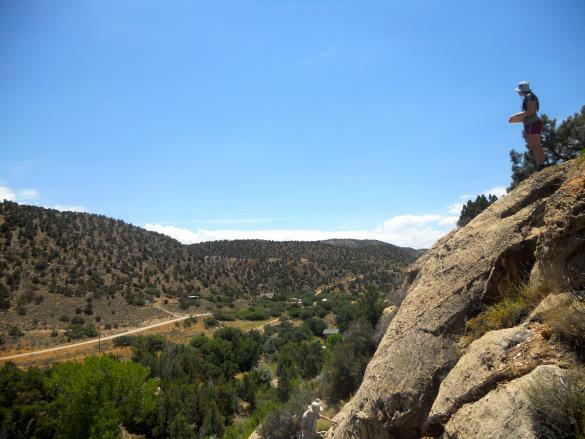 The following day we did more oncolite work, collecting at least 150 float samples, in the Flagstaff at “Snake Ridge,” which was cleverly named by Dr. Judge after countless rattlesnake sightings. Luckily for us, we have yet to see a single snake the entire trip. Knock on wood; still one day left in the field. 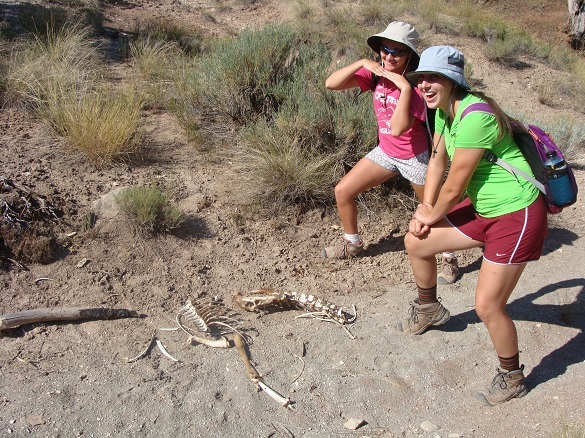 Although we haven’t seen any rattlesnakes, we’ve encountered enough kill sites to last us a lifetime. At our first sighting we ran away in disgust, but by our most recent kill site we were taking creative photos with them. We suspect our friend Freddy the mountain lion may be at fault. 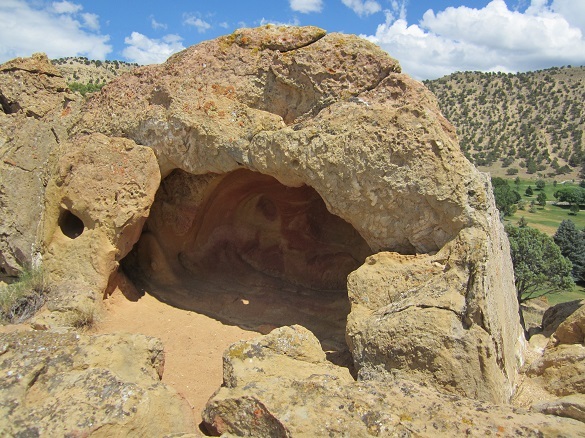 The view from the North Horn Formation. 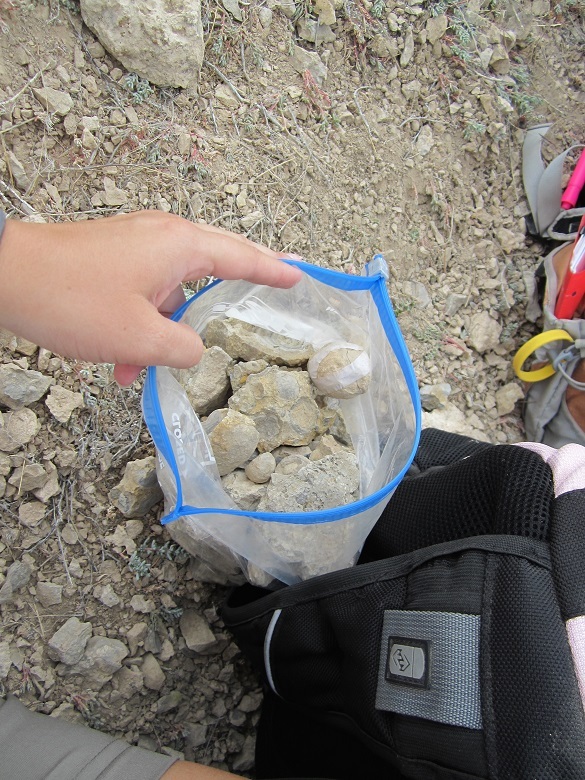 One bag out of many of the collected oncolites at the infamous “Snake Ledge.” Note the medical tape holding one of the oncolites together!! Most recent kill site shot. Maggots don’t scare us. 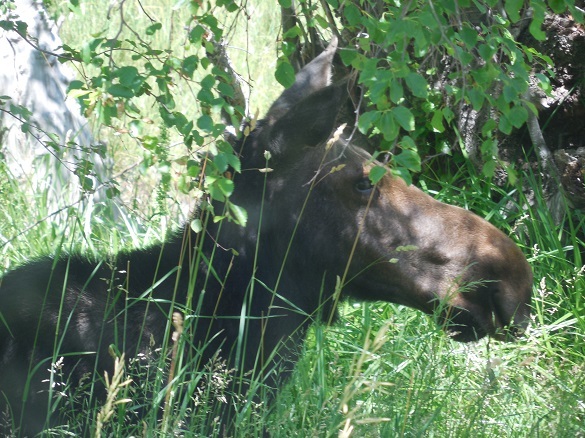 More wildlife encountered in the field. 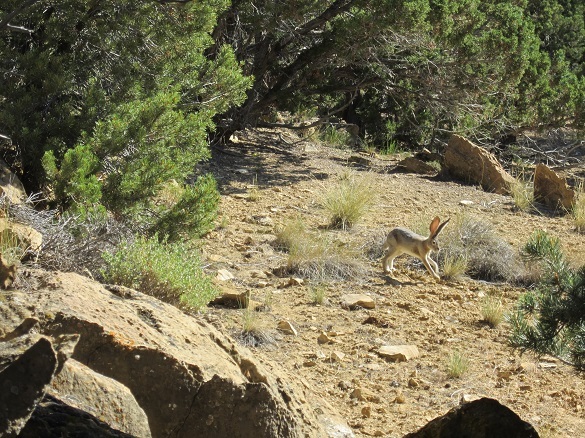 This jackrabbit kept us quite entertained for at least thirty minutes. Possible homestead of the one and only Freddy the mountain lion. The three beauties above are productid brachiopods from the Road Canyon Formation (Middle Permian, Roadian, approximately 270 million years old) in the Glass Mountains of southwestern Texas. They are part of a series we’ve done on the silicified fauna of a block of limestone we dissolved in the lab many years ago. 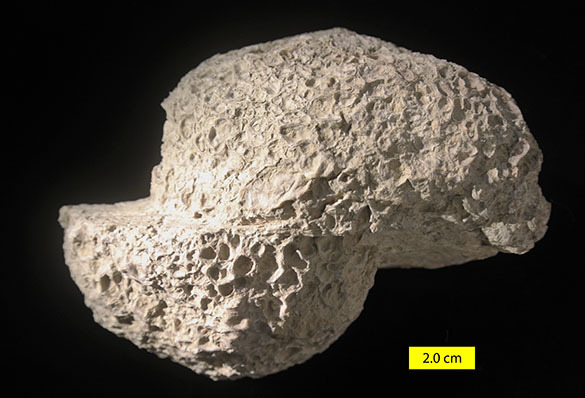 The calcitic shells have been replaced with silica during the process of fossilization, so they can be extracted from the carbonate matrix with hydrochloric acid. 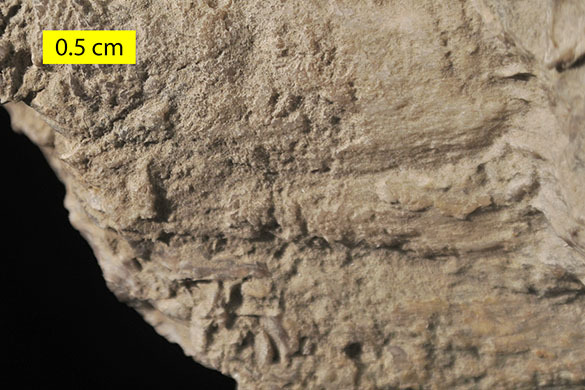 This is a primary way we can see delicate parts of a fossil, like the long hollow spines above. Ordinarily these would have been lost under the usual processes of taphonomy. 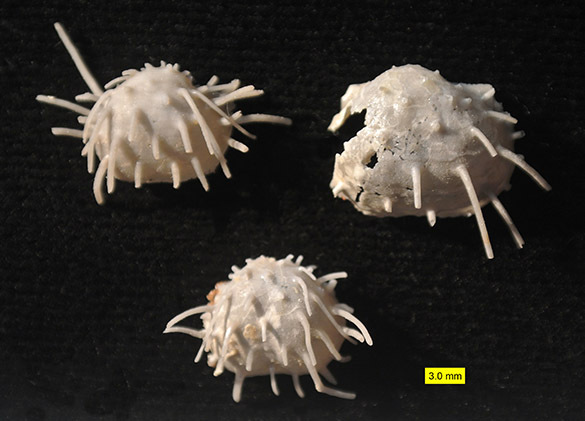 The specimens are highly convex ventral valves, which are characteristic of the productid brachiopods. 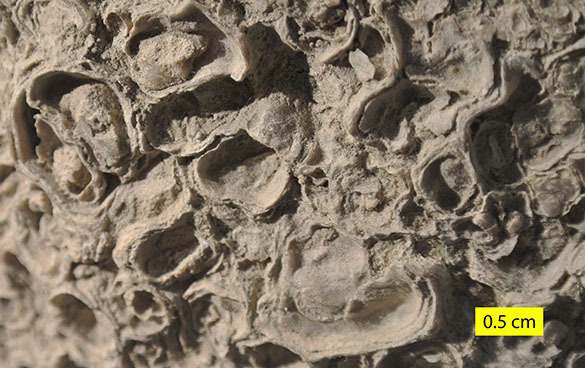 The long hollow spines helped distribute the weight of these brachiopods on soft and unstable substrata, like a sandy or muddy sediment. This is often called “the snowshoe effect”. 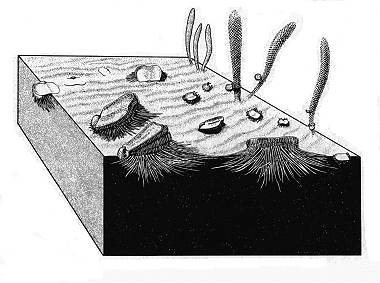 Below is a diagram reconstructing productid brachiopods on a sandy substrate with their spines keeping them from sinking below the sediment-water interface. 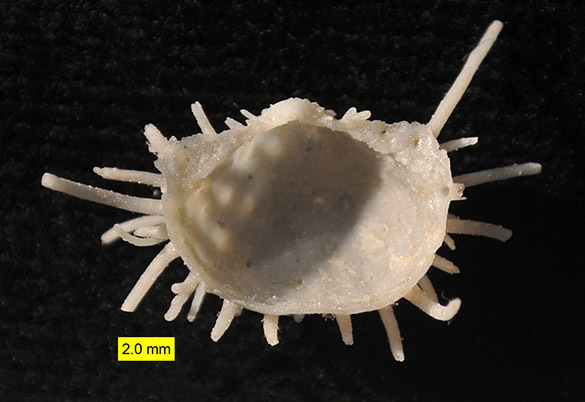 Here is a closer view of the ventral valve exterior of one of these productid brachiopods. 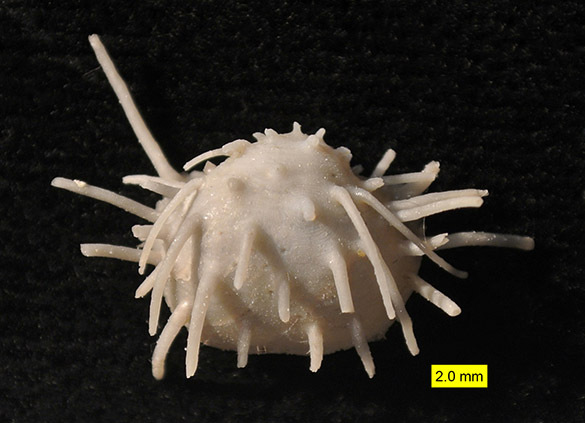 You can see how delicate the hollow spines are. This is the interior of the same valve. Each spine has a hole connecting it to the inside of the shell. The mantle, which secretes the shell and has other physiological functions, extended out into each spine to build its length and possibly carry some sort of sensory abilities. I have been unable to identify these brachiopods because of the bewilderingly large number of them described by Cooper and Grant in the 1960s and 1970s. Maybe one of our readers can give it a shot! Brunton, C.H.C., Lazarev, S.S. and Grant, R.E. 1995. A review and new classification of the brachiopod order Productida. Palaeontology 38: 915-936.
Cooper, G.A., and Grant, R.E., 1964, New Permian stratigraphic units in Glass Mountains, West Texas. American Association of Petroleum Geologists Bulletin 48: 1581-1588.
Cooper, G.A., and Grant, R.E. 1966. Permian rock units in the Glass Mountains, West Texas, In: Contributions to stratigraphy, 1966: U.S. Geological Survey Bulletin 1244-E: E1-E9. Shiino, Y. and Suzuki, Y. 2007. Articulatory and musculatory systems in a Permian concavo-convex brachiopod Waagenoconcha imperfecta Prendergast, 1935 (Productida, Brachiopoda). Paleontological research 11: 265-275. 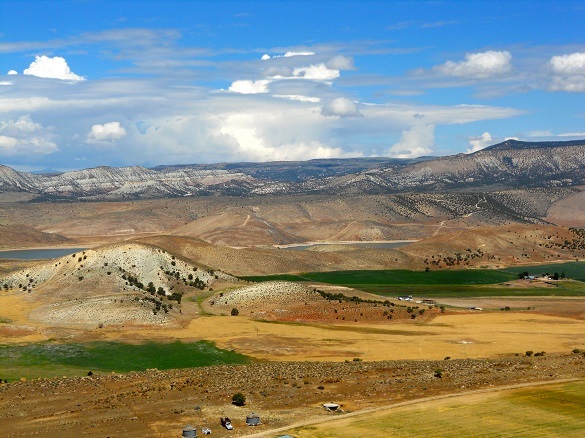 EPHRAIM, UTAH — A week into Utah, and feelings are mixed between slight hysteria for those who continue to fall off the couch in the evening due to exhaustion and an ongoing sense of awe of the beautiful world that exists outside Ohio. 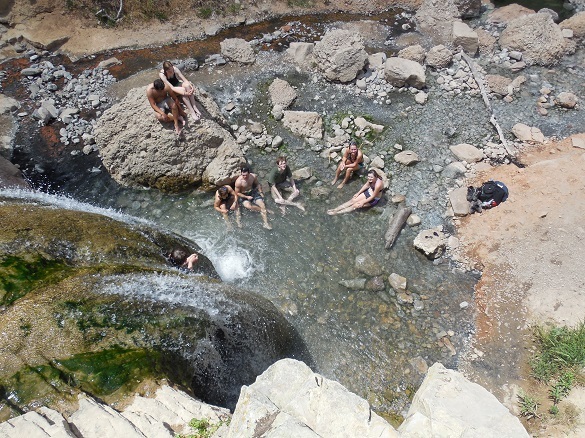 Sunday was a day off for us, and so the four of us hopped in a van with some of the OSU field camp students – including recent CoW graduate Tricia Hall – and headed to some hot springs near Spanish Fork. We smelled like sulfur the rest of the day, but the waterfall and pools were worth it! ​Wednesday was very I.S. focused for Michael and myself. For my part, I am a double major in Religious Studies as well as Geology. So in order to meld my I.S., Dr. Judge drove me to Nephi to meet the Chairwoman of the Paiute Indian Tribe of Utah. It was very enlightening to talk to a native and political spokeswoman of the tribe, and I learned so much of political, historical and socioeconomic activity of the Paiutes for the last millennia. 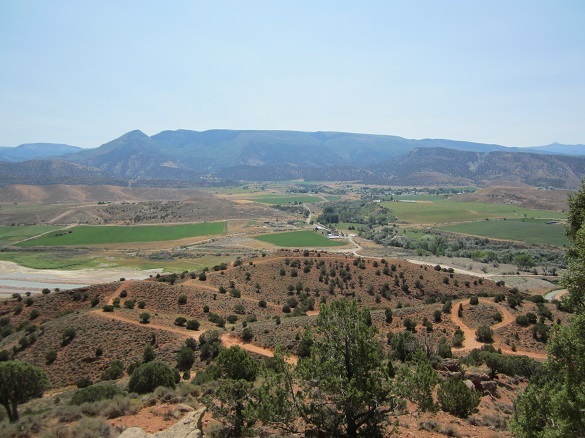 Dr. Judge also enjoyed the meeting – possibly more than myself – in learning all the ways that the Paiutes have lived and prospered in the areas where she has worked and researched for several years. After Dr. Judge and I got back from Nephi, Michael and I spread out on the floor with a multitude of topographic maps of Utah trying to decide what we would like to do for I.S. At the moment, that is a prospect Michael and I irrationally believe is completely​ unattainable. But Dr. Judge has faith in us. 15 days. 22 bears. 4 bald eagles. 47 rock samples. Wow. What a trip. I, a native Los Angeles city dwelling kid, have had the utmost pleasure of accompanying such a dynamic and energetic team of geologists to Mt. Edziza. Northern British Columbia is absolutely unreal. Far from the city lights and piercing sirens, our camp was nestled between Pillow Ridge and Tsekone Ridge. We spent a solid five days in the field collecting a variety of physical samples such as pillow lava, breccia, lapilli tuff, xenoliths, etc. 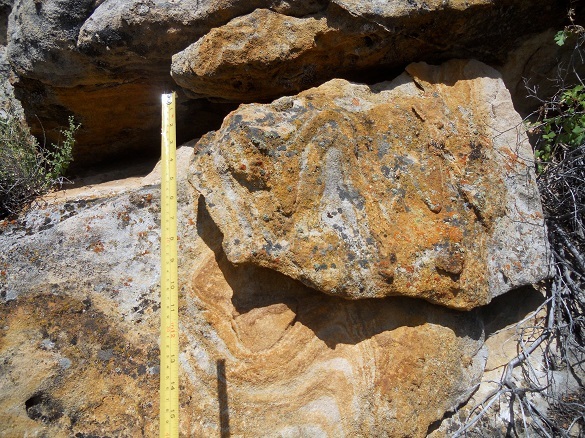 We also spent a great deal of time quantitatively and qualitatively describing pillow lava from the west side of Pillow Ridge with trend and plunge measurements, vesicularity estimates, phenocrysts estimates, and horizontal and vertical measurements. Within those five days we celebrated a birthday (HAPPY BIRTHDAY MEAGEN), Canada Day, The Fourth of July, and overall triumph of a great trip. 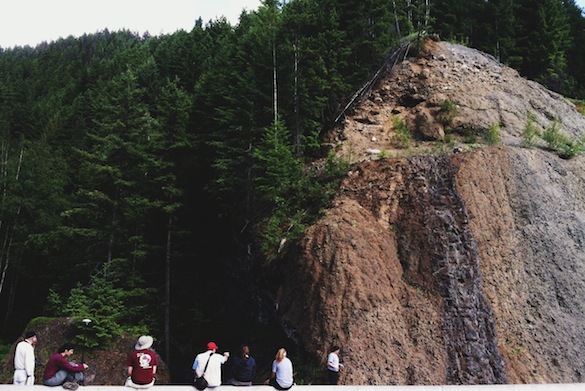 The team observing a dyke at Second Canyon, Wells Gray Provincial Park, BC. 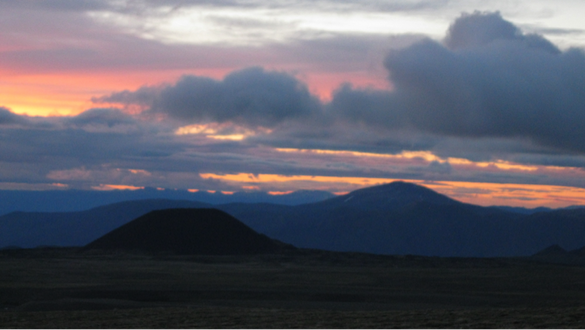 Eve Cone in the distance at dusk. Quite possibly the greatest thrill of my life, so far. We are back in lab for these next couple of weeks processing the rock samples from the field. I am really going to miss these two goons. Mary and Julia were the most welcoming Scots. Hopefully there will be more Dickinson College and The College of Wooster collaborations in the near future. Fieldwork in British Columbia was hard. We covered a lot of ground both in transit and during hikes, made a number of pillow descriptions, and brought back more samples than we had initially intended. It was also cold, it rained, it snowed, it hailed, the wind blew, bears roamed near camp, and the talus slopes were unforgiving. But it never felt like work because each day was met with laughter, learning, beautiful sunsets, Nutella, and a definite feeling of accomplishment. It is so difficult to explain just how amazing our time in British Columbia was, because it was one of the most unforgettable experiences ever. The images below allow for a visual story of our trip, when words simply don’t suffice. 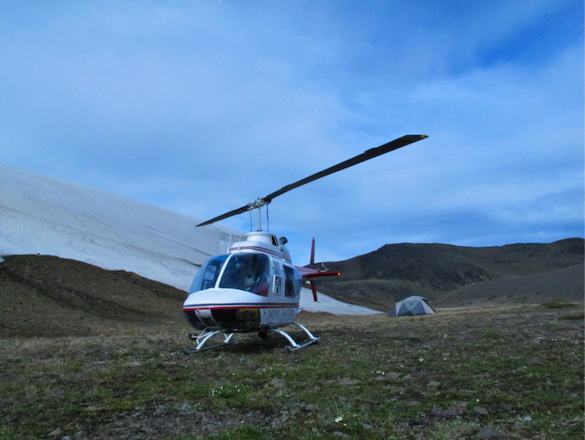 Photo credit to Mary R; The provincial park where we camped (located near Pillow Ridge) allows no vehicle access, which makes traveling by air critical. Note basecamp in the background. 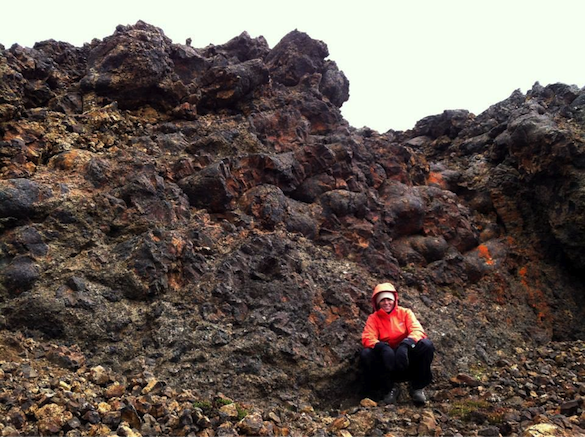 Photo credit to Liz P; A nice pillow exposure interlaid with tuff breccia on Pillow Ridge, with Julia F. for scale. 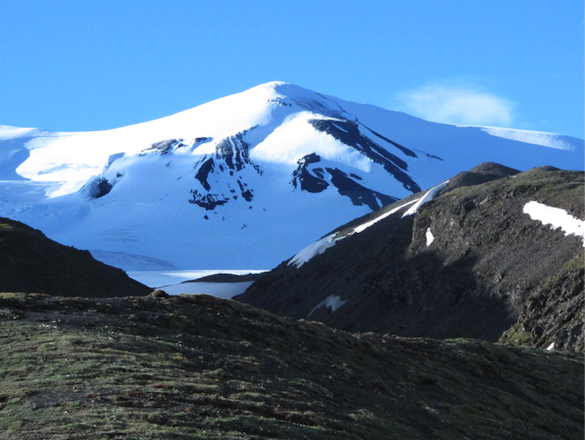 Photo credit: Mary R; Mount Edziza stratovolcano located west of basecamp. Photo credit: Julia F; A sunset view from basecamp. 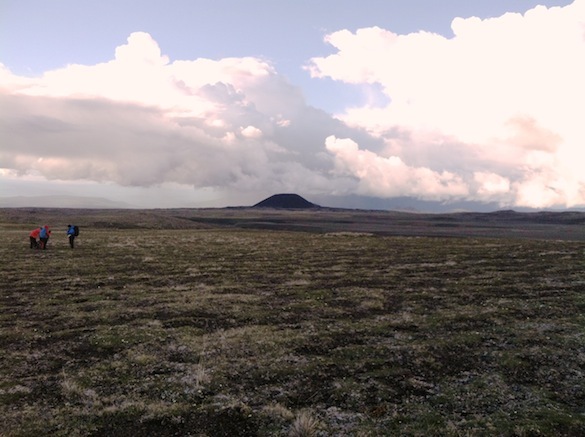 Pictured on the horizon is Eve Cone, one of the youngest cinder-cone volcanoes in the provincial park. 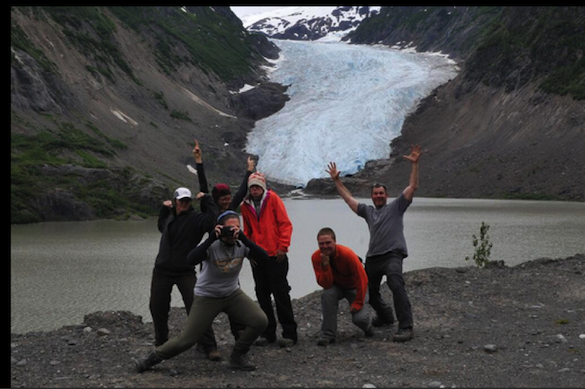 Photo Credit: Ben E. British Columbia field excursion summer 2014, we made it (more or less) in one piece. 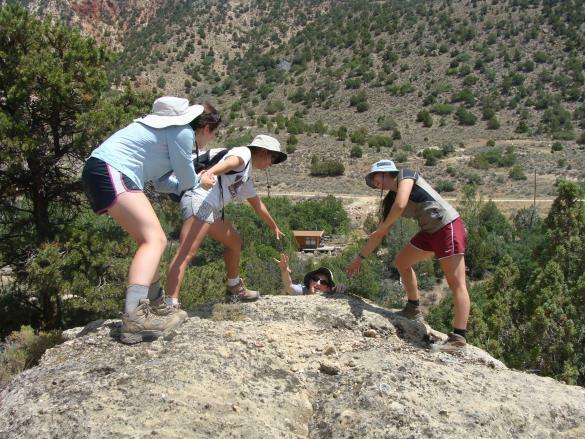 EPHRAIM, UTAH –Team Utah 2014 is now approaching the one-week mark of being in the field. For the past four days we’ve been working on one of Dr. Judge’s pet projects: deformation bands and fluid flow in the Sixmile Canyon Formation. 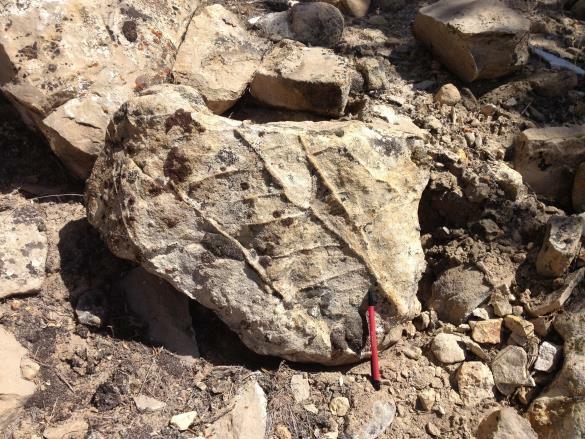 This Cretaceous sandstone underwent some serious deformation during the building of the Rocky Mountains, and this strain reveals itself in several remarkable features, including jointing, deformation bands, and bizarre outcroppings of iron. Team Utah has been working hard to measure, categorize, date, and record these features, all while enduring non-stop, brain-melting heat. We agreed early on that work would begin every morning at 8:00am, so naturally we don’t actually make it out in the field until 9:00am or later. It’s a short drive followed by an even shorter hike to our field site, so it’s typically still mid-morning as we begin the day’s work. Each day has had us focusing on different features in our area. Our most productive days involve measuring the orientations of joints. 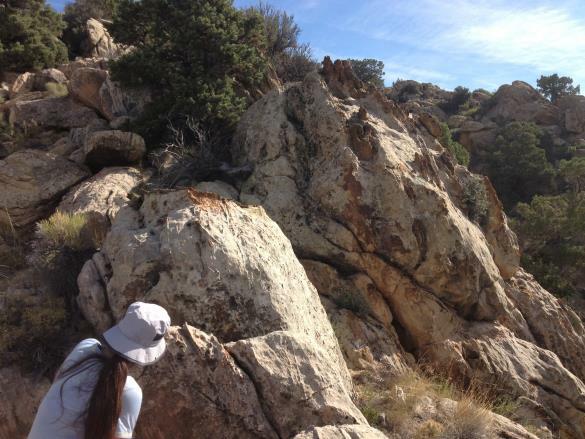 Other days we hike for hours, looking for the perfect outcrop of deformation bands. No matter our mission, the charge is led by Measurement Machine Shelley Judge, Brunton in hand and field notebook at the ready. 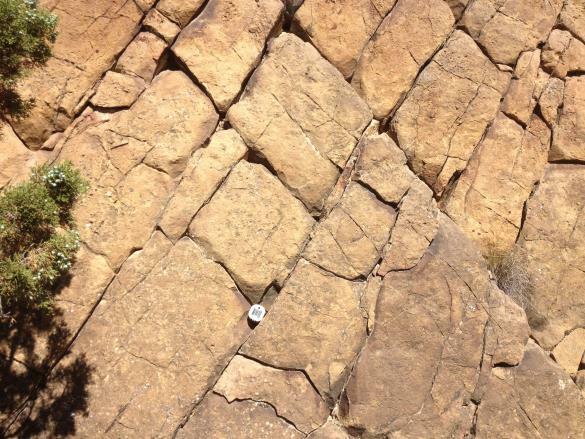 Some nice sets of joints in a nearly horizontal wall of sandstone. On our first day alone we managed to measure just over 200 individual joints. Brunton Compass for scale. Kelli examines some bizarre iron fins protruding from the rock face. We suspect that these were caused by fluid flow through the porous rock. A beautiful example of deformation bands forming Riedel ladders. 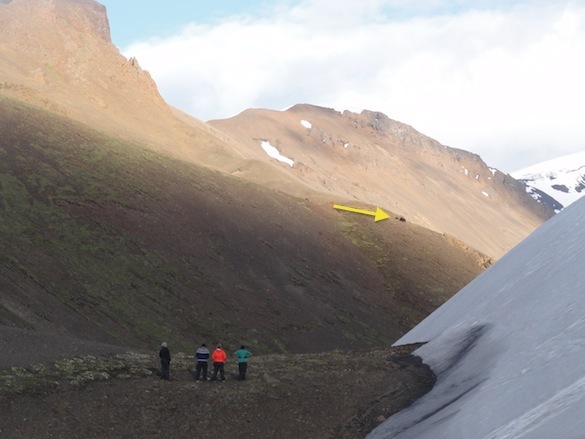 Unfortunately, this particular rock had fallen off the outcrop, and so it couldn’t be included in our data. 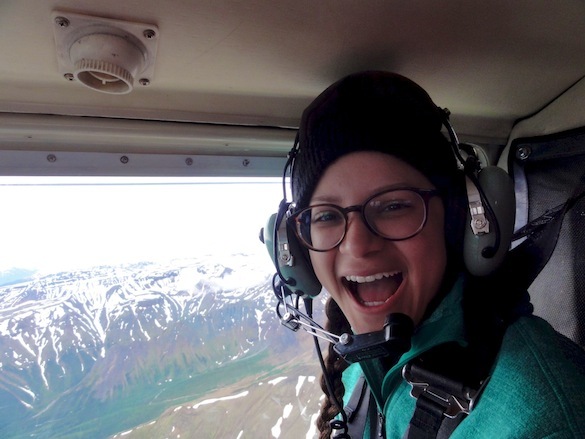 Michael down below (bottom center), measuring orientations of deformation bands, while Kelli records from above (top right). Sometimes, when the heat starts getting to us, we decompress by falling off of cliffs. 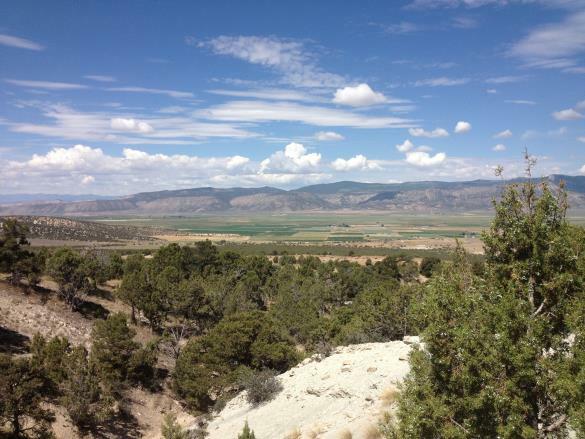 You can’t help but occasionally stop to admire the postcard-like beauty of the Sanpete Valley. Even temperatures upward of 100 degrees can’t stop the Scott spirit. 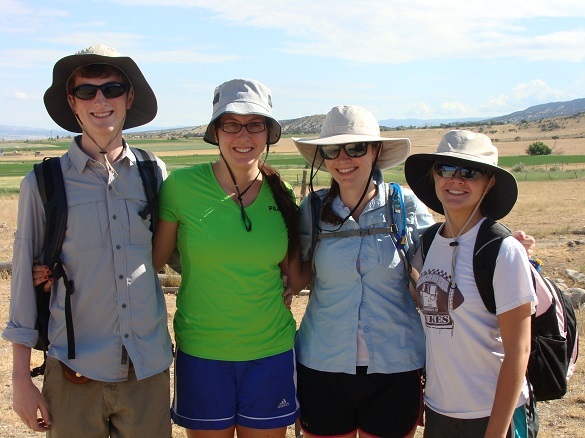 EPHRAIM, UTAH — On July 9, four Wooster students traveled to Utah to begin structural and stratigraphic research with me. They will be out here until July 22, when we will all fly back to Ohio together. I’d like to introduce these students to you!! In the coming days, I’m going to ask each of the students to blog in order to reflect on their time in Utah thus far. 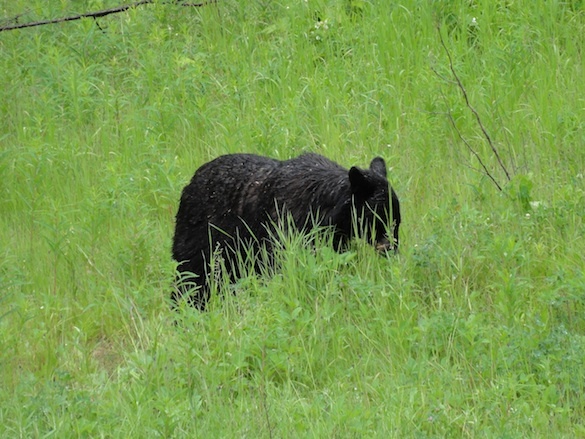 They have nearly been here for one week, so stay tuned for some additional news from Ephraim! !